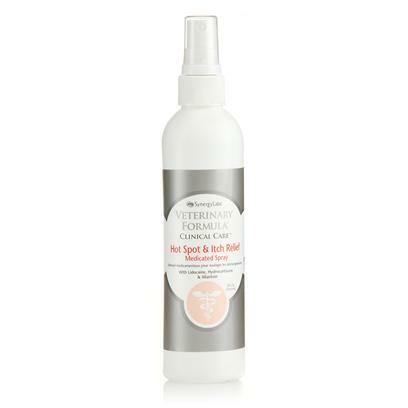 Veterinary Formula Clinical Care Hot Spot & Itch Relief is a medicated analgesic and anti-inflammatory spray. It provides rapid relief of inflammation, itchy skin and other associated conditions. Clinical Care Hot Spot & Itch Relief has minimum ingredients, so you know you're not slathering your pet and your home with a slew of unnecessary chemicals. It works almost immediately to take the sting and itch out of common skin wounds, and to get your pet back to their relaxed self. Veterinary Formula is manufactured by Synergy Labs, the same company Cesar Milan's trusts to manufacture his own line of dog shampoos! Shake well. Spray affected area thoroughly and evenly until wet. Treat twice daily for one week, then once per day for one more week. If needed, continue every other day for two additional weeks. For topical use only on dogs and cats over 12 weeks. Avoid contact with eyes. If irritation develops, discontinue use and consult your veterinarian.